Abrons Arts Center, NYC, USA on June 28, 2010. Cover photo by Maurice Berland. 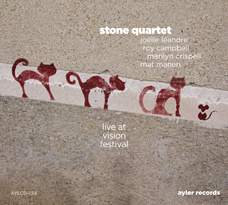 Bruce Lee Galanter pinpointed this one as "the best set of the 2010 Vision Fest" and we have to agree that this drumless quartet, first convened by contrabassist Joëlle Léandre as part of a series at The Stone in 2006 (released as The Stone Quartet on DMG/ARC in 2008), offers an impressive four way conversation between Marilyn Crispell (piano), Mat Maneri (viola), Roy Campbell (trumpet, flutes) and Léandre, each dipping into and dropping out of as the moment demands, but with a cohesiveness which undermines any thought of randomness. Here you can find another highlight of the quartet's ability to perform measured free improvisation, with all combinations explored without grandstanding, everyone's ego subsumed to the needs of the music.